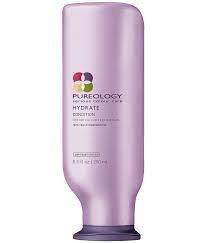 The Pureology Hydrate collection is take-all-my-moneys good. My hair has super oily roots, and very dry ends (due to dying, swimming, just being a grub) and the Hydrate Conditioner was magic. Pureology is as the name suggests: pure. No sulfates, no bad stuffs, only goodness that will leave you with Disney-Princess style hair. Do I even need to explain why they are amazing? Likely not. But I will anyway. I’m Ouai all the way, baby! My faves are the Wave Spray and the Texturizing Hair Spray. I’ve churned through the Texturizing Hair Spray at an alarming rate – it’s my go to after I’ve curled or tonged my hair (much better than hairspray!). I use both on the reg, as they’re very in line with my ‘products that accentuate natural traits’ philosophy. I have messy hair that has a lot of grit and both of these work like an episode of Charmed. This year I’ve been focusing on accentuating natural beauty, trying to accept myself the way I am and using products that really work for me. What’s all this got to do with Oribe? Well, part of that was finding products that worked with my natural hair (rather than against it or just not working at all). I LOVE Oribe Surfcomber Tousled Texture Mousse, as it does just that. I’m normally very anti-mousse as I hate the wet-crunchy look, but – if used correctly – Oribe gives you (well, me) a natural waved and textured look. You don’t need a lot – start with less than you think you need – and rub it over both your hands, then I start underneath and scrunch. I scrunch all the way through, only adding more if needed. If I want some extra wave, I’ll scrunch all my hair together, clip it and leave it for 10 minutes. It’s the ultimate natural-wavey-volumised-texture-beach hair, rather than hair that shares adjectives with cereal (wet, crunchy). I already had a thing for volumising powder, but this year I took it to a whole new ranting level. Volumising powder is one of my Scout’s-Honour-swearby products. It gives texture, volume and all round fabulous hair. What were your fave hair products in 2018?